(she/her) Nancy's MDS Status: Discworld, Young Wizards: reading w/Mark; Babylon 5: SO EXCITED TO REWATCH WITH MARK! Like this tidbit from the B5 Books editor: "The role of brothel owner Jacob Mayhew [in 'The River of Souls'] was originally offered to Peter Jurasik, but the casting did not work out. If Jurasik had been able to play the part and TNT had not objected to Andreas Katsulas portraying Galen in 'A Call to Arms,' two of Babylon 5's most iconic actors would have appeared sans makeup in back-to-back TV movies." JMS said he likes playing in this particular universe, so when someone offers him the chance to "stick around a little while longer with these characters," he is obligated to take it "because I'm selfish and I like playing with these characters." Doing more TV movies also allowed him to show "what goes on afterward... what happens in a situation where our characters have all moves on." "[I]t was a combination of hating to leave the universe behind and tell one more story and have some fun with it." JMS: "I was on the set earlier today watching them shoot the scene with Peter Woodward in the circle of stones, and man, he's good, he's really really good. I was walking out with a big old grin on my face, saying, 'We got one!'" There was trouble with the casting of Peter Woodward because he didn't have the right kind of working papers, and they didn't find out about it until three days before he needed to be ready to shoot. Warners said that if they couldn't get the legal stuff straightened out, they couldn't use him. "So John called her at the White House, and she said, 'Let me take care of this,' so in return for a box of Babylon 5 cool stuff -- I'm sure Kenneth Starr will come in and interview us at any time about this whole thing. We called her office on Tuesday or Wednesday and it was resolved by Thursday...."
Dureena's eyes went through a number of changes, trying to find the right amount of yellow or gold in them. "Once I said that, they got the image and brought in a different kind of tough, smaller female character. Television is filled with the tall, willowy model types, and this is not meant to be that type. This is a pug, a street fighter, and once she showed up, we knew she was the one, that was the end of the discussion." JMS on Tony Todd as Captain Anderson: "I got the impression from the audition that he's a very nice man, and he had that commanding voice that you want for a captain. He seemed perfect for it." I got distracted yesterday and forgot to post the G'Kar gifs I made lo, these many years ago. Better late than never, eh? Because if there's one thing this series is all about is being emotionally devastated by G'Kar. So much of what's in the Q&A is spoilery, so I'll hold off on sharing it for a few weeks; I don't want folks to have to miss out. Q: A common complaint about The Legend of the Rangers is that the Rangers were too willing to die rather than finding a less lethal way of defeating their opponents. In retrospect, is this a plot element that you would be changed or was it essential to the story? A: I kind of wanted them young and impetuous and idealistic, the "die with honor" solution being their first resort rather than what it should be, their last resort. They would've learned to temper that in time, especially after one of them died defending the rest in ways that could have been avoided. Q: What if any difficulties did you have in writing and revising the script for The Legend of the Rangers? A: There weren't a lot, really. The main focus was in trying some new things to make it visually different from B5 while still feeling consistent with that universe. Q: Was the Hand somehow connected to the race from "Thirdspace?" And why was it said that the Hand are more ancient and more powerful than the Shadows? A: That's what they said, but that doesn't mean it would ultimately be true. And no, no connection to "Thirdspace." Q: The Legend of the Rangers seemed to have few ties to the B5 back story. Why not make use of more existing canon in the story? A: In a pilot, you usually just try to keep in as much information as is needed to get that story and leave it at that; to put in too much B5 backstory would've been to clutter up the structure, and possibly scare off audiences who might've felt they needed a flow-chart to keep up with the mythos of the series. "What you have to do, when watching 'The River of Souls,' is look at Lochley gradually becoming unhinged and transpose me into that role. I was basically writing myself at the end of year five going slowly and irrevocably batshit." Question: "The idea of Mayhew's acquisition of Lochley's image for the holo-brothel neatly mirrors the Soul Hunters' unsolicited collection of the Ralgans' essences. Did the two notions occur to you separately and then coalesce in the script or did you work at devising a B-plot that would counterpoint your A-story (or vice versa)?" Answer: "That's one of those chicken-egg (see above) questions that I'm not sure I can really answer with any efficacy. I know I started with the Soul Hunter notion, went looking for something to annoy Lochley, and when I hit on the use of images in the holo-brothel, suddenly realized, Hey, look, there's counterpoint! Sometimes you tell the story, and sometimes the story tells itself, and this was one of the latter. These things just seem to happen. As with 'Thirdspace,' Art By Accident." On how the treatment of souls here relates to the B5 question "Who are you? ": "I think that's best left to the viewer to decide for him- or herself. The story is put out there to ask questions, to get people to talk about the nature of the soul, and identity. For me to say, 'Here's what it means and here's what it says about who you are,' defeats the purpose. The answer is different for everybody, as it should be. Are we immortal beings? Or as transient and insubstantial as bath bubbles? Is one's soul the sum of one's parts, or are one's emotional parts the projection of one's soul?" About Martin Sheen: "We were all very surprised that Martin Sheen wanted to do an SF project, but just as happy to have him. He was a bigger than life kind of guy, who loved to hold court and tell stories. He was also very big on encouraging everybody around him to get into a 12 step program, whether or not they actually needed it. I joined him for lunch one day, and he was telling me I needed to get into such a program. 'I don't smoke, I don't drink, I don't gamble, and I don't do drugs,' I said. 'So why do I need a 12 step program?' He thought about it for a long time, then finally said, 'Anybody that much in control has enough personal issues to fuel a 13 step program, so get to it.'" On writing Lochley as the ultimate authority figure: "I always saw Lochley as an authority figure, even when she was second banana to Sheridan. She has an authoritarian personality, regardless of her precise title. She's a control freak. And I like taking control freaks and putting them into situations where slowly, despite every intelligent decision they make the situation starts to unravel and so, in time, do they." On Corwin getting a more featured role: "I always tried to let everyone in the cast have their moment in the sun, their chance to shine, and Joshua Cox had never really had that opportunity during series. Everybody liked him (I hate people like that), and everybody said he really deserved and had earned his moment. So I gave it to him, and was just as happy for having done so. He brought such a sense of earnestness to it. The part really wouldn't have worked otherwise." On the humor in Babylon 5 and "The River of Souls": "Part of it comes from fatigue. When I get tired, I get funny. Well, I think I get funny. What the rest of the world thinks of it, I leave to others. So right off the bat (as it were), as exhausted as I was after B5, I got pretty loopy and I was open to the idea of something balls-out funny. Which is in part what led to the holo-brothel story, I thought it was funny. "In addition, toward the end of B5, everybody and his mother was stopping by my office with self-help stuff due to my obviously depleted and deathlike disposition. Jeff Conaway and Pat Tallman kept depositing vitamins on my desk in big glassine bags (at least I assumed they were vitamins). Someone else gave me one of those stupid back-rollers that you can only use by throwing your back out in the process of getting just the right angle. Another gave me meditation CDs. So as I was trying to come up with something that could be given to Lochley that would annoy her, I looked out across my desk, saw all those things left there by others... well, what would you come up with?" "That's all part of the fun: moving things we recognize in the present into the future to see how they look. It lets us make fun of them or explore them in new ways. Anybody who thinks the legal system isn't going to follow us into the future, and into space, is kidding themselves. That's why we have Ombuds and courts shown in B5 from the very start. I find those situations both funny, and vastly annoying to live through, so again, when looking for something to annoy Lochley, a lawsuit fits right in." On going directly from "Objects at Rest" to "The River of Souls": "It was just really, really, really, really, really strange. In general terms, when I finish writing any script, there's a... well, for lack of a better term, a refractory period when I just don't want to write anything else for a little bit because of the emotional release generated by that act of creation. I need to go lay down for a while. Maybe have some chips. I can write three scripts at the same time up to the point of finishing one of them, but when I'm done with one of them, I'm done for the night. The bigger the script, the more important the project, the longer the refractory period. "Having just written FADE OUT to a five year long story consisting of 91 scripts just of my own, every synapse I had left in my head just said, "Okay, that's it, we're going to Hawaii, see you in two years." It wasn't just B5, I didn't want to write anything. I just wanted to curl up deep in a cavern somewhere and heal. Instead, I had to gird up my loins (and that whole loin-girding thing just takes longer the older you get) and keep writing. It was, to be honest, pretty hellish in that respect. "In addition, because it was in the B5 universe, to which I'd said a huge and emotional goodbye in "Objects at Rest," it felt like walking back into a party for more food after having said goodnight and the hosts were already upstairs to bed. It felt weird on every imaginable level." "One of the subjects that has always fascinated me is the question of the soul, both as supernatural entity and as something more earthly, the sum total of our personality, outlook, attitudes, the sense of self that forms who we are. Where does one end, and the other begin? When we look in a mirror, who is that person looking back at us? I like playing around with questions like that." "I've always been drawn to the idea of wandering around empty, ancient worlds and stumbling upon amazing things left behind by their creators. Leftover technology whose purposes we may not even quite understand. This goes all the way back to my flirtation with Lovecraft's fiction, where you'd find yourself standing on vast, cyclopean stairs under anthracite towers half a mile high, glimpsing things utterly beyond your comprehension... so alien that if you ever really did understand them, you'd go insane. "I loved that feeling, that frisson, and tried as much as I could to bring it into B5. This was another example." That is one of my favorite pieces of music from this show (the other being the first part of the Season 5 opening credits). I love how it's sad and there's a finality to it, but it's also noble and hopeful and optimistic. 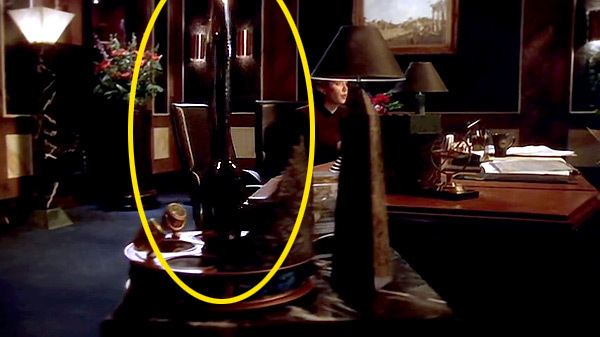 In something that's not entirely emotionally devastating, did you notice the Hugo award in Ivanova's office? This is a very, very good review.